Certain leftwimp blogs and twits are going scooters trying to paint the Tea Party movement and the G.O.P. in particular with the foul stain of racism. 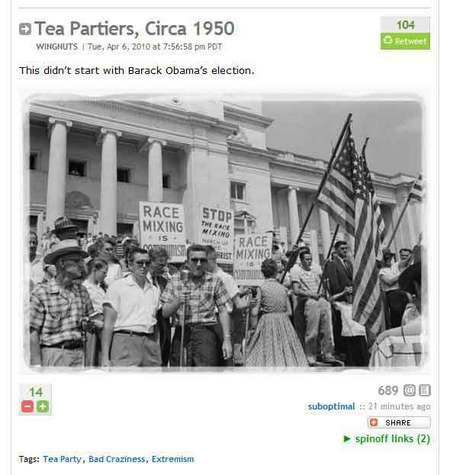 The photo below began circulating last year, generally with the sentiment that it�s a photo of the Tea Partiers from not-so-long ago. There�s one pesky little problem with their attacks. ALL OF THOSE PEOPLE PROTESTING WERE DEMOCRATS. The photo was taken 20 August 1959 in front of the Little Rock State Capital Building. The protesters were opposed to racial integration, and were marching in support of Arkansas Governor Orval Faubus� segregationist platform. Faubus was the one who called on the Arkansas National Guard in 1957 to prevent integration. Faubus was an indoctrinated communist who couldn�t get elected unless he ran as a Democrat. This page contains a single entry by DaveH published on April 7, 2010 8:41 PM. Spammers was the previous entry in this blog. A bit of hail is the next entry in this blog.